Simple Roast Chicken - What the "Forks" for Dinner? Simple Roast Chicken - What the "Forks" for Dinner? Preheat the oven to 450°F. Rinse the chicken, then dry it very well with paper towels, inside and out. Salt and pepper the cavity, then tie the legs of the bird together. Tying the chicken helps it cook evenly, and it also makes for a more beautiful roasted bird. Now, salt the chicken— (1 tablespoon). I know it seems like a lot but it makes a nice uniform coating that will result in a crisp, salty, flavorful skin. Season to taste with pepper. 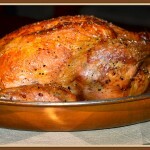 Place the chicken in a roasting pan and roast for 50 -60 minutes or until internal temperature is 165*. While the chicken is roasting, leave it alone,don’t baste it, and do not add any liquid.Remove it from the oven and add the thyme to the pan. After it is out of the oven,baste the chicken with the juices and thyme and let it rest for 15 minutes on a cutting board. Reserve the juices that are in the bottom of the pan. You can use some to dip the chicken in ( the juices are beyond delicious) or you can save it to flavor a dish using any left over chicken. The preparation is meant to be rustic Serve with a simple green salad.